Liver fibrosis is a condition of abnormal proliferation of connective tissue due to various types of chronic liver injury often caused by viral infection and chemicals. Effective therapies against liver fibrosis are still limited. In this review, we focus on research on Chinese medicines against liver fibrosis in three categories, namely pure compounds, composite formulae and combination treatment using single compounds with composite formulae or conventional medicines. Action mechanisms of the anti-fibrosis Chinese medicines, clinical application, herbal adverse events and quality control are also reviewed. Evidence indicates that some Chinese medicines are clinically effective on liver fibrosis. Strict quality control such as research to identify and monitor the manufacturing of Chinese medicines enables reliable pharmacological, clinical and in-depth mechanism studies. Further experiments and clinical trials should be carried out on the platforms that conform to international standards. Liver fibrosis is a condition of abnormal proliferation of connective tissue due to various types of chronic liver injury often caused by viral infection and chemicals. Hepatitis B viral (HBV) infection is the major cause of liver fibrosis in China, whereas hepatitis C viral (HCV) infection and alcohol are the main causes in the United States, Europe and Japan [1–4]. Liver fibrosis may progress into liver cirrhosis and other complications coupled with carcinogenesis [5, 6]. The pathogenesis of liver fibrosis involves the activation of hepatic stellate cells (HSCs), the over-expression and over-secretion of collagens, and consequently an excessive accumulation of extracellular matrix (ECM) proteins . Research has been focused on the management of liver fibrosis including the elimination of primary diseases, immunomodulation, suppression of hepatocyte inflammation, prevention of death and damage of hepatocytes, inhibition of over-secretion and accumulation of ECM proteins, promotion of ECM degradation, improvement of microcirculation and metabolism of liver and reduction of complications . The reversal of liver fibrosis and even cirrhosis has been documented . Complementary and alternative treatments of liver fibrosis have been under active research worldwide [10–12]. In Chinese medicine, liver fibrosis is thought to be caused by 'poor blood circulation, toxin stagnation and a deficiency of healthy energy' (dysregulated metabolism). Thus, Chinese medicine therapy to treat liver fibrosis is mainly based on reducing blood stagnation, resolving stasis, eliminating toxins and enhancing body immunity. This review aims to provide an overview on the types of Chinese medicines used to treat liver fibrosis. Around 20 compounds or extracts from Chinese medicines have been reported to have liver protective and anti-fibrotic effects. Various studies on their chemistry and pharmacology as well as clinical trials have been carried out to study these compounds or extracts. Table 1 summarizes those with liver protection and anti-fibrotic effects demonstrated in various research reports [13–68]. Root of Salviae miltiorrhiza Bge. Rhizome of Glycyrrhiza uralensis Fisch., Glycyrrhiza inflata Batal. or Glycyrrhiza glabra L.
Rhizome of Ligusticum chuanxiong Hort. Root and Rhizome of Rheum palmatum L., Rheum tanguticum Maxim. Ex Balf. or Rheum officinale Baill. Rhizome of Curcumae longa L.
Leaves of Ginkgo bioba L.
Aerial part of Artemesia annua L.
Reduce AST and ALT, against HBV replication, suppress NF-κB activation in cell or animal models. Ripe seed of Plantago asiatica L.
More than ten composite formulae for liver fibrosis have been reported [69–108]. Table 2 summarizes traditional composite formulae such as Yinchenhao Tang, Xiao Chaihu Tang, Buzhong Yiqi Tang and Renshen Yangrong Tang as well as modern formulae such as Fufang Jinsane, Danshen Taoxiong Tang, Ershen Zezhu Tang, Buqi Jianzhong Tang, Fangji Tang, Handan Ganle, Ganzhifu and Fuzheng Huayu. Significantly decrease HA, LM, P-III-P and IV-C content, improve serum Alb, ALT, AST, GGT, LM, HA, Hyp and ration of BCAA/AAA in animals and CHB patients. Inhibit HSCs activation via FN/integrin signaling. Studies [109–118] show that combination therapy improves clinical anti-fibrotic effects by using a single compound with composite formulae or Chinese medicines with conventional medicines (Table 3). CHC patients. With IFN therapy, ALT levels did not decrease more than 50%, while with IFN combined with SNMC therapy, ALT levels decreased approximately 70% in all patients (one became normal), but no other parameters were changed. CHC patients belong to interferon-resistant or unstable patients. Improving liver-specific enzyme abnormalities: AST, ALT and gamma-glutamyl transpeptidase, no change HCV-related factors or liver histology compared with control. Liver fibrosis patients. Combination therapy improves AST, ALT and reduces HA, LN, CIV, TGF-β1 and TNF-α. CHB patients. Combination therapy improves AST, ALT, Tbil and has synergistic anti-fibrosis in biochemical parameters, but IFN and/or Sho-saiko-to may also induce acute interstitial pneumonitis. CHB patients. Synergistic effects in improving liver functions and fibrotic factors. CHB patients. Treatment with both drugs was better than one and more effective than the control group in parameters of liver function and liver fibrosis. CHB patients. Combined treatment of BSG and MI was better than Lamivudine group in one year therapeutical course. HBV and HCV infections account for most liver cirrhosis and primary liver cancer worldwide . Certain Chinese medicines are anti-HBV and anti-HCV. Berberine markedly reduces viral production in vitro but is toxic to host cells . Artemisinin and artesunate strongly inhibit viral production at concentrations that do not affect host cell viability; artesunate and lamivudine exhibit synergistic anti-HBV effects . Another study shows that ascucubin inhibits HBV replication . Nobiletin, the active ingredient of Citrus unshiu peel, has anti-HCV effects . Clinical studies show that oxymatrine  is effective in reducing hepatitis B viral replication in patients with chronic hepatitis B. Xiao Chaihu Tang enhances production of interferon-gamma (IFN-γ) and antibodies against hepatitis B core and e antigen by peripheral blood mononuclear cells (PBMC) in patients with chronic hepatitis . Handan Ganle inhibits viral DNA replication in patients with decompensated cirrhosis thereby leading to clinical improvement . Buzhong Yiqi Tang and Renshen Yangrong Tang demonstrate immunomodulation effects . In a study on porcine serum-induced liver fibrosis in rats , Interleukin 13 (IL-13) levels are positively correlated with hydroxyproline (Hyp) contents in the liver. Buzhong Yiqi Tang and Renshen Yangrong Tang significantly suppress the increase of hepatic Hyp, while Xiao Chaihu Tang does not. Short-term and long-term studies  show that Renshen Yangrong Tang is effective in liver fibrosis. Further studies find that Renshen Yangrong Tang inhibits HCV infection, and that Gomisin A, an active component in the formula's Schisandra fruit, exhibits protective effects on immunological hepatopathy . Salvia miltiorrhizae (Danshen) extract  improves serum superoxide dismutase (SOD) activity and reduces malondialdehyde (MDA) content in both carbon tetrachloride (CCl4) and dimethylnitrosamine (DMN) induced hepatic fibrosis rat models. Salvia miltiorrhizae extract  increases hepatic glutathione levels and decreases peroxidation products in a dose-dependent manner. Taurine [27, 28] reduces oxidative stress and prevents progression of hepatic fibrosis in CCl4-induced hepatic damaged rats and inhibits transformation of the hepatic stellate cell (HSC). In chronic ethanol-induced hepatotoxicity or CCl4-induced rat liver fibrosis, Panax notoginseng (Tianqi) extract or total saponin extracted from Panax notoginseng reduces the generation of MDA, scavenges free radicals, increases liver and serum SOD content and reduces the accumulation of body lipid peroxide [44–46]. Ginkgo biloba (Yinxing) extract [49, 50] and berberine [54, 55, 60] exhibit anti-oxidation effects and suppress nuclear factor κB (NF-κB) in rats or cell culture. Yinchenhao Tang is used to treat liver fibrosis and portal hypertension through suppressing the activated HSC function by genipin, an absorbed form of its component, in CCl4-or pig-serum- induced rat liver fibrosis . Lin et al. find that the hepatoprotective effect of Solanum nigrum Linn extract on CCl4-induced liver fibrosis is achieved through blocking oxidative stress. Xiao Chaihu Tang [76, 83, 85] whose active components baicalin and baicalein function as a potent fibrosis suppressant via the inhibition of the oxidative stress in hepatocyte and HSC. Handan Ganle  is effective in protecting against liver fibrosis by inhibiting lipid peroxidation in hepatocytes and HSC in vivo. The fibrogenic process is regulated by TGF-β1 and the specific blockade of TGF-β1/Smad3 signalling may therapeutically intervene in the fibrosis of various tissues . Most of the Chinese medicines listed in Tables 1 and 2 exhibit in vitro and in vivo inhibitory effects on TGF-β1. Salvianolic acid B (SA-B) inhibits HSC proliferation and collagen production and decreases the cellular TGF-β1 autocrine and Mitogen-Activated Protein Kinase (MAPK) activity, which may be the anti-fibrosis mechanism of SA-B [14, 17]. Paclitaxel, a compound isolated from Taxus brevifolia, suppresses the TGF-β1 signalling pathway between biliary epithelium cells and myofibroblasts and reduces collagen synthesis . Yinchenhao Tang  regulates platelet-derived growth factor (PDGF)-BB-dependent signalling pathways of HSC in primary culture and attenuates the development of liver fibrosis induced by thioacetamide in rats. Among the components of Yinchenhao Tang, 3-methyl-1,6,8-trihydroxyanthraquinone (emodin) derived from Rhei rhizoma is the most active compound . Genipin, a metabolite derived from Yinchenhao Tang, suppresses wound-induced cell migration and proliferation and decreases collagen type I, TGF β1 and α-smooth muscle actins (α-SMA) mRNA and protein expression . Chen et al. demonstrate that Gypenosides inhibits PDGF-induced HSCs proliferation through inhibiting the signalling pathway of PDGF-Akt-p70S6K and down-regulating cyclin D1 and D3 expression. Another study shows that ganoderic acids and ganoderenic acids in Ganoderma lucidum (Lingzhi) extract significantly inhibit the proliferation of HSCs by attenuating the blockade of PDGFβR phosphorylation . Chen et al. show that 0.5 g/kg/day of Xiao Chaihu Tang significantly reduces the serum level of the N-terminal pro-peptide of collagen type III (PIII NP) and the mRNA expression of TGF-β1 and PDGF in a rat bile duct ligated model. Yamamoto et al. find that Yinchenhao Tang inhibits hepatocyte apoptosis induced by TGF-β1 in vitro. Another study  demonstrates that pre-treatment with Yinchenhao Tang markedly suppresses liver apoptosis/injury. Genipin, which is a principal ingredient of Yinchenhao Tang, suppresses Fas-mediated apoptosis in primary-cultured murine hepatocytes in vitro . The resistance to Ca2+-induced mitochondrial permeability transition (MPT) is enhanced in liver mitochondria of genipin-treated mice . These results suggest that the anti-apoptotic activity of genipin via the interference with MPT is a possible mechanism for the therapeutic effects of Yinchenhao Tang and that Yinchenhao Tang and its ingredient genipin protect hepatocyte from liver apoptosis/injury. Conversely, activated HSC plays a pivotal role in hepatic fibrosis, HSC apoptosis is involved in the mechanisms of spontaneous resolution of rat hepatic fibrosis, and the agent that induces HSC apoptosis has been shown to reduce experimental hepatic fibrosis in rats . Considerable interest has been generated in uncovering the molecular events that regulate HSC apoptosis and discovering drugs that can stimulate HSC apoptosis in a selective manner. Ikeda et al. find that Yinchenhao Tang induces HSC apoptosis in a time- and concentration-dependent manner as judged by the nuclear morphology, quantitation of cytoplasmic histone-associated DNA oligonucleosome fragments and caspase-3 activity. Thus, the induction of HSC apoptosis may be the mechanism whereby Yinchenhao Tang treats hepatic fibrosis. Tetrandrine  also induces apoptosis of T-HSC/Cl-6 cells and induces the activation of caspase-3 protease and subsequent proteolytic cleavage of poly (ADP-ribose) polymerase. Berberine derived from berberis markedly reduces viral production in vitro . In liver damage induced by paracetamol or CCl4, Berberis aristata fruit extract and berberine, its principal ingredient, show hepato-protective action [52, 53]. Berberine also exhibits antioxidative effects on tert-butyl hydroperoxide-induced oxidative damage in rat liver  and in the lipopolysaccharide (LPS) plus ischemia-reperfusion model . Berberine abolishes acetaldehyde-induced NF-κB activity and cytokine production in a dose dependent manner, suggesting the potential role of berberine to treat alcoholic liver disease (ALD) . In the rat liver fibrosis induced by multiple hepatotoxic factors (CCl4, ethanol and high cholesterol), the serum levels of ALT and AST and the hepatic content of MDA and Hyp are markedly decreased, while the activity of hepatic SOD is significantly increased in berberine-treated groups in a dose-dependent manner. In addition, histopathological changes, such as steatosis, necrosis and myofibroblast proliferation, are reduced and the expression of α-SMA and TGF-β1 is significantly down-regulated in the berberine-treated groups . Clinically, berberine has been used in Japan to alleviate hypertyraminemia in patients with liver cirrhosis . Berberine possesses anti-tumor effects in rats and mice with chemical-induced liver cancer  and anti-invasion in human lung cancer cell lines . The mechanism may be related to its anti-inflammation effects [60, 61]. The inhibitory effects of two different doses of berberine in human liver cancer HepG2 cell lines display different effects: in HepG2 cells treated with 24.0 mg/L of berberine, an increase in the sub G0 phase that indicates cell death is observed in cell cycle analysis with flow cytometry, however, there is no significant increase in sub G0 in HepG2 cells treated with 4.0 mg/L of berberine . These results demonstrate that the dosage of berberine is a meaningful factor in liver diseases treatment. Composite formulae, such as Xiao Chaihu Tang, not only inhibit viral replication, ameliorate inflammation and enhance regeneration of hepatic cells, but also inhibit HSC proliferation, suppress intra- and extra-cellular secretion, decrease the secretion of collagen and promote its degradation and re-absorption [79–90]. Shimizu et al. show that Xiao Chaihu Tang functions as a potent anti-fibrosis agent via the inhibition of oxidative stress in hepatocytes and HSCs and that its active components are baicalin and baicalein. It should be noted that baicalin and baicalein are flavonoids with chemical structures very similar to silybinin which possess anti-fibrogenic activities. Several composite formulae have been used to improve ascites induced by hepatic cirrhosis in chronic hepatitis B (CHB) or chronic hepatitis C (CHC) patients. We demonstrate that Buqi Jianzhong Tang and Fangji Tang increase Na+ excretion and urine volume and reduce GOT and GPT in rats with CCl4- induced liver damage [89, 98]. Most of the Chinese medicines in Tables 1 and 2 reduce serum enzymes, i.e. aspartate transaminase (AST) and alanine transaminase (ALT). A study with multivariate analysis demonstrates that the mode of therapy and ALT levels are significant factors affecting HCC development . Glycyrrhizin administered as Stronger Neo Minophagen C (SNMC) and Xiao Chaihu Tang exhibit this effect [24–26, 90] in long-term clinical trials. Considered to possess anti-carcinogenic properties, Xiao Chaihu Tang inhibits chemical hepatocarcinogenesis in animals, acts as a biological response modifier and suppresses the proliferation of hepatoma cells by inducing apoptosis and arresting the cell cycle. Among the active components of Xiao Chaihu Tang, baicalin, baicalein and saikosaponin have the ability to inhibit cell proliferation . Some anti-fibrosis Chinese medicines, such as Salvianolic acid B (SA-B), tetrandrine and oxymatrine, are clinically effective. SA-B reverses liver fibrosis in chronic hepatitis B patients. SA-B reduces the serum HA content and decreases the overall serum fibrosis markers better than IFN-γ . A multi-centre, randomized, double-blind, placebo-controlled clinical trial shows that oxymatrine effectively reduces the DNA replication of HBV [34, 35] and the therapeutic effect is even stronger when used together with Xiao Chaihu Tang . A double-blind, randomized, placebo-controlled phases I/II trial of intravenous glycyrrhizin for the treatment of chronic hepatitis C shows that glycyrrhizin lowers serum ALT and that the treatment has no effect on the RNA levels of HCV . Long-term clinical trials in Japan and the Netherlands demonstrate that interferon non-responder patients with chronic hepatitis C and fibrosis stage 3 or 4 have a reduced incidence rate of HCC after glycyrrhizin therapy normalizes ALT levels [24, 25]. In China and Japan, many composite formulae are used to treat liver fibrosis and cirrhosis (Table 2) and the pharmacological effects and mechanisms have been demonstrated [69–94]. Experimental and clinical studies show that Handan Ganle is effective [99–102]. Fuzheng Huayu, another modern formula, has also been intensively studied [104–107]. The results suggest that Fuzheng Huayu's anti-fibrosis effects may be associated with the inhibition of liver collagen production . Further study reveals that the conditioned medium from activated HSC stimulates the quiescent HSC proliferation and type I collagen secretion and that the drug serum inhibits this stimulating action and vascular endothelial growth factor (VEGF) secretion from the activated HSC. Fuzheng Huayu acts effectively against the autocrine activation pathway of HSC . A recent study demonstrates the action of Fuzheng Huayu against HSC activation via the fibronectin/integrin-5β1 signalling pathway . Another study shows that Fuzheng Huayu alleviates liver fibrosis without any adverse events . 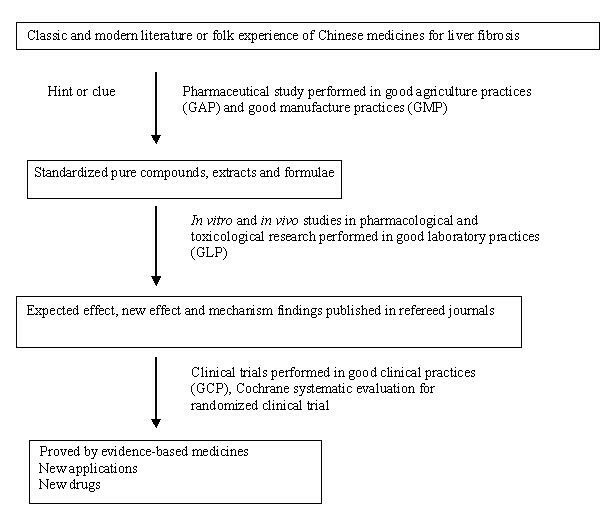 A systematic review analyzes the efficacy and safety of Fuzheng Huayu in treatment of CHB fibrosis  based on clinical trials with placebo and/or random control (other positive Chinese medicines and conventional drugs). Seven studies on Fuzheng Huayu in the treatment of CHB fibrosis (total 590 cases) are included in the systematic review. This systematic review concludes that Fuzheng Huayu has significant improvement of serum fibrosis index and pathology of liver biopsy (class S in fibrosis) without observable adverse events, although some included studies are of low quality and are small randomized clinical trials. The combined therapy with ursodeoxycholic acid and glycyrrhizin is safe and effective in improving liver-specific enzyme abnormalities, and may be an alternative to interferon in chronic hepatitis C viral infection, especially for interferon-resistant or unstable patients . The antiviral efficacy of Bushen granule (BSG) coupled with marine injection (MI) to treat chronic hepatitis B was more effective than lamivudine treatment . Other reports of therapeutic value gained through combining conventional and Chinese medicines can be found in Table 3[112–117]. There have been reports on adverse events and hepatotoxicity caused by herbal medicines . Xiao Chaihu Tang, used alone or in combination with interferon, may induce acute interstitial pneumonia in patients with chronic active hepatitis [113, 114]. Glycyrrhizin injection may induce fatal biliary cirrhosis . A one-year study demonstrates that Chinese medicines caused hepatotoxicity in patients with chronic hepatitis B . Some of hepatic veno-occlusive diseases have been ascribed to toxicity of herbs; however, the toxic compounds remain to be determined. Hepatic veno-occlusive disease may result from pyrrolizidine alkaloids which are found in numerous plants worldwide. Systematic toxicological knowledge of Chinese medicines is available . Adverse events in the cases of herbal toxicity are in fact very complex. The fatal biliary cirrhosis case  was a 50-year-old woman suffering from a diffuse skin rash, high fever and jaundice immediately after a second injection of glutathione and stronger neo-minophagen C, which contains glycyrrhizin. It is difficult to determine the cause of the adverse events to be indeed glycyrrhizin (which is extracted from Glycyrrhiza uralensis) for the following reasons: (1) no literature has shown the hepatotoxicity of glycyrrhizin until now; (2) stronger neo-minophagen C includes 0.1% cysteine and 2.0% glycine in physiological saline solution as well as 0.2% glycyrrhizin, and is also combined with glutathione; and (3) the clinical indication of glycyrrhizin was clear enough (glycyrrhizin is only used in chronic liver hepatitis without bile duct obstruction, which is Yinchenhao Tang's indication in Chinese medicine clinical practice), and glycyrrhizin has no anti-fibrotic effect in rats with fibrosis induced by bile duct ligation and scission . While ample evidence supports Chinese medicines in treating liver fibrosis, some recent reviews on clinical trials did not find significant effects. Levy et al. review the use of silymarin, glycyrrhizin, Xiao Chaihu Tang, Phyllanthus amarus, Picrorrhiza kurroa, Compound 861, CH-100 and LIV.52 used to treat chronic liver diseases. Dhiman et al. review Phyllanthus, Silybum marianum (milk thistle), glycyrrhizin and LIV.52 used to treat liver diseases. However, neither review recommends the use of herbal medicines to treat chronic liver diseases. SA-B, Glycyrrhizin, Xiao Chaihu Tang and Yinchenhao Tang are used to treat chronic liver diseases in China and Japan. The major active herb is coptis, of which berberine is the major active component . According to Chinese medicine theory, we use coptis to treat various liver diseases and cancer in Hong Kong . We also propose to replace bear bile with coptis in Chinese medicine practice . Further studies on pharmacological actions and clinical efficacies of the anti-fibrosis effects of Chinese medicines are warranted. Systematic reviews to evaluate clinical studies on the efficacy and safety of Chinese medicines are also necessary. An exemplifying strategy for these studies is demonstrated in Figure 1. Research chart of Chinese medicines for liver fibrosis. The re-evaluation involved in pharmaceutical and medical research including herb quality control, mechanism study and clinical trial will be carried out on standardized international platforms. Evidence indicates that some Chinese medicines are clinically effective in treating liver fibrosis. Strict quality control of Chinese medicines is critical  for pharmacological, clinical and in-depth mechanism studies . Experiments and clinical trials should be carried out on the platforms that conform to international standards . The study was financially supported by grants from the Research Council of the University of Hong Kong (Project Codes: 10208005 and 10400413), the University Grants Committee (UGC) of Hong Kong (Project Code: 764708M), the Pong Ding Yuen Endowment Fund for Education and Research in Chinese-Western Medicine (Project Code: 20005274) and the Government-Matching Grant Scheme (4th Phase, Project Code: 20740314). The authors would like to thank Prof SP Lee and Dr GKK Lau for their assistance in revising the manuscript. Fuzhen Huayu is a herbal product developed by PL's institution at the Shanghai University of Traditional Chinese Medicine. The authors declare that they have no competing interests for other Chinese medicines discussed in the present study. YBF and YT conceived the study, interpreted the data and revised the manuscript. YBF retrieved and analyzed the data and drafted the manuscript. KFC and NW retrieved the data from Chinese journals and translated them into English. PL and TN supervised some of the experiments. All authors read and approved the final version of the manuscript.